Soak up a sleek lakeside break in Maccagno, with this luxury lake view resort apartment with pool! Make your holiday memories unforgettable, with an exclusive stay in this fully air-conditioned 1 bed retreat for 4. Situated to the 1st floor of a modern new-build lakeside residence, guests need only go outside to enjoy a full range of luxury on-site facilities; including an outdoor pool, jacuzzi, marina and sailing club! Inside, the modern apartment has been styled to offer plenty of space, style and home comfort. The spacious apartment is perfectly suited for a couple or flexible family group of 4. Equipped with free WIFI, a flat screen TV with DVD player and all the must-have facilities for a self-catering holiday, the apartment offers everything you need to kick start your stay. The inviting sitting area is accompanied by a slick fully-equipped Kitchen Diner and a private lake view terrace; with stylish rattan furniture on hand for those all-important alfresco entertaining moments. The spacious Master Bedroom is perfect for couples and boasts terrace access too. The sumptuous modern King Size bed provides the perfect excuse to enjoy a guilt-free lie-in during your stay, whilst the generous wardrobe space enables you to fully unpack and feel at home. A contemporary fitted luxury bathroom offers a walk-in shower, a wash basin, WC, bidet and heated towel rack. A hairdryer and washing machine are also provided. The apartment is ideal for year-round lake stays, being fitted with toasty underfloor heating and refreshing air con. The 1st floor apartment is easily reachable by lift and outside private parking can be found to the basement underground car park. The luxury lake view ‘Golfo del Sole’ residence offers every imaginable convenience for those seeking to soak up a full-on lake break. For those wishing to relax, the gorgeous outdoor Lido with swimming pool and jacuzzi (weather dependant, and normally open from the 15th April - Mid October from 8am till 8pm) is just the ticket. For those craving some action and lake-based fun, the Golfo del Sole residence offers a Sailing club, a marina with boat moorings and a variety of climbing walls, tennis courts, beach volley ball court and mountain biking opportunities along the nearby woodland trails. 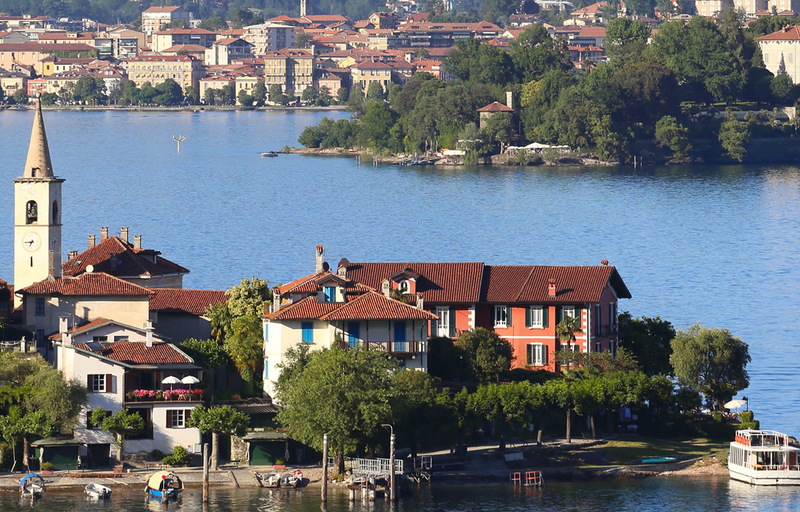 Pretty Maccagno is a well-serviced resort town along the north-eastern shore of Lake Maggiore. Its medieval architecture, sandy beach, marina and local amenities provide the perfect holiday base for couples, small groups and families. The nearby resort town of Luino (7 minutes’ drive away) is home to ferry and train links, as well as one of the largest weekly markets in Europe; ensuring your kitchen cupboards stay stocked up! Guests can easily get out and explore the many tourist attractions of Lake Maggiore, as well as a fantastic selection of regional golf clubs (all within 40 km), the ski slopes at Forcora (15 minutes’ drive away) and the famous Swiss ski resorts of San Bernardino, Airolo and Andermatt (all reachable by car in just over an hour). The gorgeous apartment provides the ideal exclusive holiday base for couples, honeymooners and groups of 4. Also upon request, travel baby cots, high chairs and single adult camp beds can also be hired (for an extra cost). Also for larger groups, the ‘Golfo del Sole’ residence offers a great selection of holiday apartments; enabling multiple groups to be accommodated (upon request). The principal private terrace invites guests to sit outside and enjoy a holiday drink or alfresco snack; with gorgeous lake and pool views for company. Guests can also fully enjoy the onsite resident facilities. The fantastic range of facilities include a resident Accommodation Manager, underground parking, a sunny lake view Lido with swimming pool, a Jacuzzi, a Sailing club and a Marina. For those looking to bring or hire a boat during their stay, boat moorings can also be arranged (upon request, for EU 40 per day). Other resident leisure facilities include climbing walls, tennis courts, beach volley ball and mountain biking along the nearby woodland trails. Underground resident parking features onsite. The beautiful lakeside residence is perfectly situated next to the main road and promenade of Maccagno. Here the beach, marina and town amenities can all easily be reached and enjoyed. The picturesque Medieval town offers close-proximity to Luino (7 minutes’ drive) for its famous weekly market, ferry and train links as well as the many highlights of Lake Maggiore (including the FAI Villa attractions and gardens, family-friendly zoos, the Mottarone hiking trails, UNESCO World Heritage site of Santa Caterina del Sasso, the Medieval Angera Castle, the unique Borromean Islands, the established resort town of Stresa and the knock-out palatial gardens of Isola Bella.